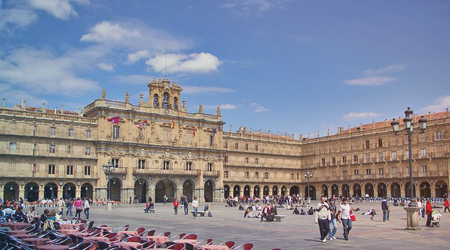 Throughout its long existence, Salamanca, has borne witness to some of the most important events in Spanish history. Pre-Roman remains have been found in the Teso de San Vicente, a Roman bridge overlooks the River Tormes, and at the end of the bridge there is a 'verraco', an Iberian statue representing a bull. Numerous inscriptions have also been uncovered in the city walls, and there are still traces of the Calzada de la Plata (Silver Route) which passed through. The city was besieged by Hannibal around 220 BC, and from about 50 BC onwards, it was part of the Roman province of Lusitania. Little information remains from the Visigothic era, and between 6th and 10th centuries AD Salamanca found itself in the heart of the No-man’s land between the Christian and Islamic kingdoms, changing hands several times before it was finally reconquered by the great pro-European king, Alfonso VI. In 1096, he handed responsibility for the repopulation of the city to his son-in-law, Count Raimundo de Borgoña, who subsequently granted Salamanca its first municipal charter. 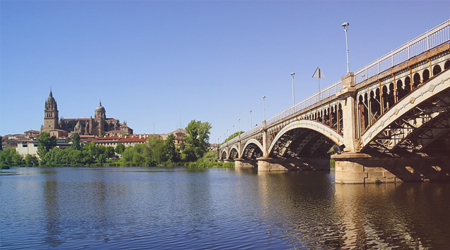 Salamanca was visited several times by the Catholic Monarchs, once after the death of their son, Prince Don Juan, in 1497, and King Ferdinand also resided there from October 1505 to March 1506. Carlos I visited Salamanca in 1534, and in 1543, Felipe II married his first wife, María of Portugal in the city. Felipe III visited Salamanca in 1600 with his second wife, Margaret of Austria. The city took part in the War of Succession, on the side of Felipe V, founder of the Bourbon dynasty. It was occupied by the troops of Archduke Charles of Austria, but was soon recovered by Felipe V. He stayed here for several days in 1710 and subsequently ordered the construction of the Plaza Mayor. Salamanca was badly affected by the Peninsular War. From 1808 to 1811 it was occupied by both the French and the British as they used Spanish soil as a battleground for European dominance. During the period, many of Salamanca’s most valuable architectural treasures were destroyed, including the Colegio Mayor de Cuenca. Finally, the Battle of Arapiles, at the very gates of the city, saw the defeat of the French at the hands of Wellington. The engagement was decisive in the eventual withdrawal of the French from Spanish territory. Meanwhile, the city developed a lively community with life at the University, the distribution of professorships and relations between lecturers and students, evolving side by side with the rest of the town. Artistically, a catalogue of the most exquisite styles has left their mark on the city. The most beautiful examples of Spanish Plateresque (silverware) style, with its decorative quality and fine execution, can be found in Salamanca. The style perfectly suited the local stone with its soft, malleable texture and beautiful golden colour. Innumerable renowned historical figures, including Fray Luis de León, Antonio de Nebrija, Francisco de Vitoria, Cervantes, Menéndez Valdés, San Juan de la Cruz, Miguel de Unamuno and Gonzalo Torrente Ballester, have connections with the city, both within the University and as members of the city’s artistic community, adding further to Salamanca’s rich heritage. Today, life in the city is not so different from any other in Spain, although its spiritual foundations (especially with the Pontificia – Catholic University) and lively student community lend it a unique atmosphere. With the Plaza Mayor at its hub, this Spanish Oxbridge thrives as one of the major cultural tourist destinations in Spain. It has been recognised by UNESCO as a World Heritage Site, and in 2002 enjoyed the prestigious mantle of European Capital of Culture. Prehistoric and Roman periods. Important archaeological discoveries have been made including dolmens, paintings and stellar stones as well as Phoenician and Celto-Iberian remains, including the 'verraco' (Iberian statue, representing a bull). The Roman bridge itself which formed part of the Via de Plata (Silver route) from Astorga to Merida still survives. Romanesque Period. After the Moorish occupation, new cultures and structures emerged, influenced by styles borrowed from the Camino de Santiago, located further to the north. The Old Cathedral is the most representative example. The Gothic Period. The gothic style was introduced, as in other communities, either renovating existing buildings or constructing new ones. The House of Shells (Casa de las Conchas) is a perfect example of this tendency. The Renaissance Period. During the XVI century the practice of patronage led to a creative explosion of impressive art. 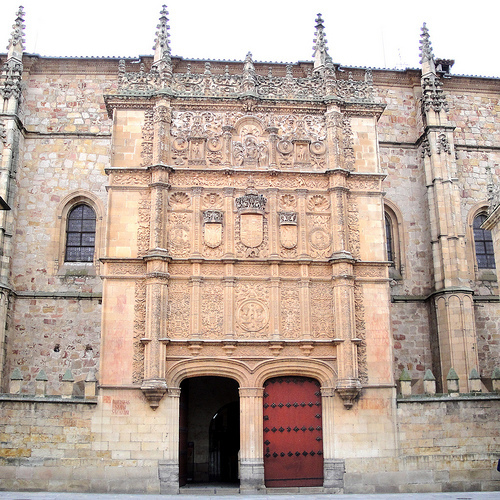 The period saw the construction of many of Salamanca’s most important buildings, including the New Cathedral, the Façade of the University, the Escuelas Menores and Colegio Mayor Fonseca, as well as many other buildings which unfortunately no longer exist. The ornamental style that gave Salamanca its distinctive architectural style during this period is known as Plateresque. The Baroque Period. The influence of the Baroque style changed the appearance of the city, with a number of major buildings, such as the Clerecía, several Colleges, Hostelries and the Plaza Mayor (Main Square), constructed at the same time. From Neoclassical period to the Present Day, over the last two centuries few buildings of any particular interest have been constructed, although there are several notable exceptions, such as La Casa de Lis with its beautiful wrought iron work. In a royal decree, drawn up in Valladolid on 16th April 1243 by Fernando III, Alfonso IX, King of Leon, is recognized as the founder of the Salmantino School in 1218. The University that then came into being is one of the oldest in Europe, established only a few years after those of Bologna and Paris. Its various original buildings represent some of the finest examples of Spanish Plateresque style, in particular the famous façade. Floral themes predominate and there is a dominant Italian style in the sculptures. The moulding and the panels include masks, fruits, children, baskets, etc. In the centre there is a medallion, a reproduction of a coin with the busts of the Catholic King and Queen, Ferdinand and Isabella. Above this, is the shield of Carlos V, flanked on either side by the two-headed imperial eagle of San Juan. The third level is less complicated, depicting naked children, women, spiral motifs and dragons. The upper part, decorated with medallions, has at its centre a pope exhorting cardinals and clergymen dressed in Italian habits.